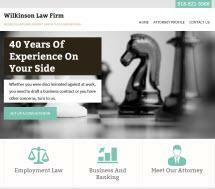 The Wilkinson Law Firm is located in Tulsa, Oklahoma. Our firm provides a broad range of legal services to individuals and business clients throughout Oklahoma. Our firm is a full service law firm, representing and advising clients in the areas of Employment Plaintiff & Defendant, Educational, Litigation, and Corporations & Business Organizational law.